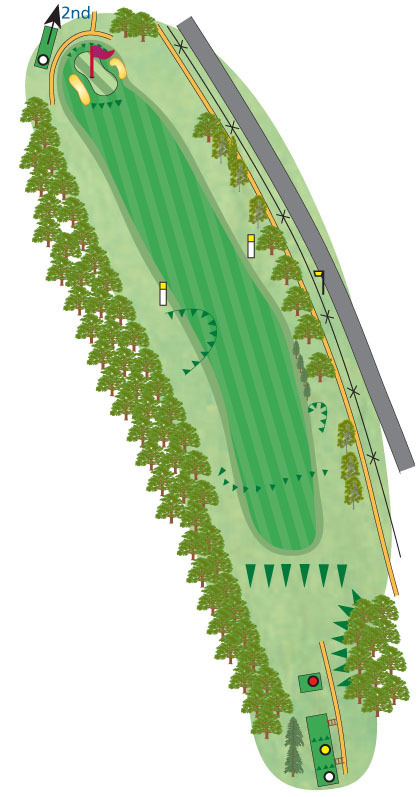 The path on the right of the first hole is designated an immovable obstruction (local rule 8). If your ball comes to rest on it, or if you have to stand on it when you play your shot, you are entitled to a free drop. Mark the nearest point of relief. Mark a point one club length from this which is no nearer the hole. Where the ball came to rest. The nearest point of relief at the side of the path. The point which is one club length away. 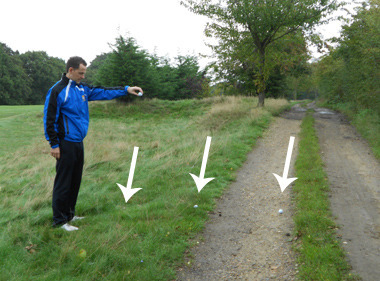 When you come to drop your ball you must stand straight and hold it at shoulder height and arms length (rule 20-2a). Drop your ball between these markers. Note; you cannot drop it in front of or outside the markers (rule 20-2b). The ball is in play if it comes to rest within two club lengths of the point where it landed when you took the drop (rule 20-2). Rolls back into a hazard. Rolls to a position where your feet would be in the hazard when you take up your normal stance – you cannot take partial relief, you must take full relief. Rolls more than two club lengths from the point where it landed when you dropped it. If you drop the ball twice unsuccessfully, you must place the ball on the spot it hit the ground the second time you dropped it (rule 20-2c).